The Pasadena Centennial Room brings together the Library’s collections of books and other materials which reflect the City’s unique historical and cultural development. Special attention is given to collecting “tomorrow’s history” which means that essential current information is also available. Access to current information is provided via the Neighborhood Information kiosk which displays for public review City Council agendas, minutes, budgets, and reports, as well as materials from City Commissions. A great wealth of information about Pasadena can be found on the City of Pasadena’s website. Pasadena’s well-documented history is represented in the collection of historical and descriptive books about Pasadena and Pasadenans: city directories; business directories; works on local art, architecture, music and cultural activities; a selection of novels set in Pasadena; and a representative selection of books by Pasadena authors and local publishers and presses. An extensive collection of City-issued documents, reports, codes, newsletters, and studies which provide citizens with historic information about the City and its operations are also available. Pasadena’s history is also reflected in the Library’s collection of approximately 8,000 photographs. The following broad subject area are covered in the collection: buildings; business; Pasadena City departments; people; organizations; transportation; and views. The collection encompasses dates from the 1880’s to the 1970’s with the bulk of the photos documenting Pasadena prior to 1925. The vast majority of library images have been scanned and are available for viewing and downloading online in the Pasadena Digital History Collaboration. If you are unable to locate and image you are looking for, please call us at (626)744-4066 and select option 7 or submit an Ask Us! request online for research help. Other materials in the Pasadena Centennial Room include maps, newspaper clippings, pamphlets, scrapbooks, newsletters, periodicals, posters, postcards, films, videos, sheet music, and sound recordings. The Pasadena Master Index provides a topical index to much of this material. If you are unable to locate and image you are looking for, please call us at (626)744-4066 and select option 7 or submit an Ask Us! request online for research help. A comprehensive collection of Pasadena newspapers on microfilm is available in the nearby Microform Center. There is no index to Pasadena newspapers prior to June 1, 1996. However, the clipping files and scrapbooks located in the Pasadena Centennial Room may be useful in locating desired materials. Beginning with June 1, 1996, the Library began the Pasadena Newspaper Index which indexes articles about Pasadena from the Pasadena Star-News, the Pasadena Weekly, the Herald Tribune and the Pasadena/San Gabriel Valley Journal. As library director from 1889 to 1919, Nellie Russ assembled a collection of books which were rare at the time of their acquisition. These books trace the history of California from its discovery and contain works in English and Spanish that relate to its rule under Spain, Mexico, and the United States. The growth of the collection is chronicled in Gertrude Stoughton’s The Books of California. A collection of letters of early Californians such as Antonio Pico, Hugo Reid, Abel Stearns and others copies of The Californian, the state’s first newspaper, founded in 1846 by Walter Colton in Monterey. A vellum bound 1787 copy of Father Francisco Palou’s life of Father Serra, Relacion Historica de la Vida y Apostolicas Tareas del Venerable Padre Fray Junipero Serra. Early accounts and guides to life in California’s gold fields such as an 1849 second edition of Wierzbicki’s California As It Is and As It May Be, Or, A Guide to the Gold Regions. Reference assistance for the collection is available all hours the Library is open from the Central Service Desk which is located in the center of the Library’s Main Hall. The collection is for reference use only and should not be removed from the Pasadena Centennial Room except to be taken directly to the Copy Center for photocopying purposes. Some items must be retrieved by the reference staff and signed out upon the presentation of a library card or some other identification. Some rare, fragile or difficult to replace items, such as photographs, will be available by appointment only. Arrangements may be made with the reference staff for making or obtaining copies of photographs or for copying oversize materials such as maps. 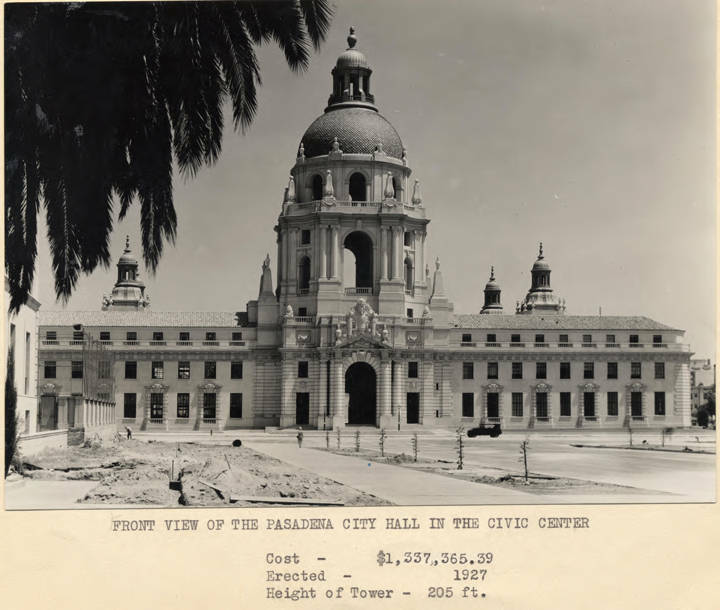 Find resources for researching general and topical Pasadena history for topics such as Pasadena architecture, the history of different ethnic groups in Pasadena, and historical photographs of Pasadena. Search the database to find current and historical newspaper citations about Pasadena. The index primarily includes citations from the Pasadena Star-News, the Pasadena Weekly, and the Pasadena Journal from 1996-Present, with some older material from these and other Pasadena news sources indexed as well. Some full text articles are also included. Access the greatest collection of digitized items in Pasadena contained in a comprehensive database of images, stories, sounds, and publications relating to Pasadena drawn from various institutions and individuals. Explore the library’s collections of historical Pasadena newspapers and directories. Ask Us! or Book Us! The Pasadena Public Library staff are always happy to help with Pasadena history research. Call us at (626)744-4066 and select option 7 or submit an Ask Us! request online for research help. You can also Book Us! for a research consultation with our local historian librarian for even more in-depth help.